The famous eGo AIO kit is back and its better than ever! 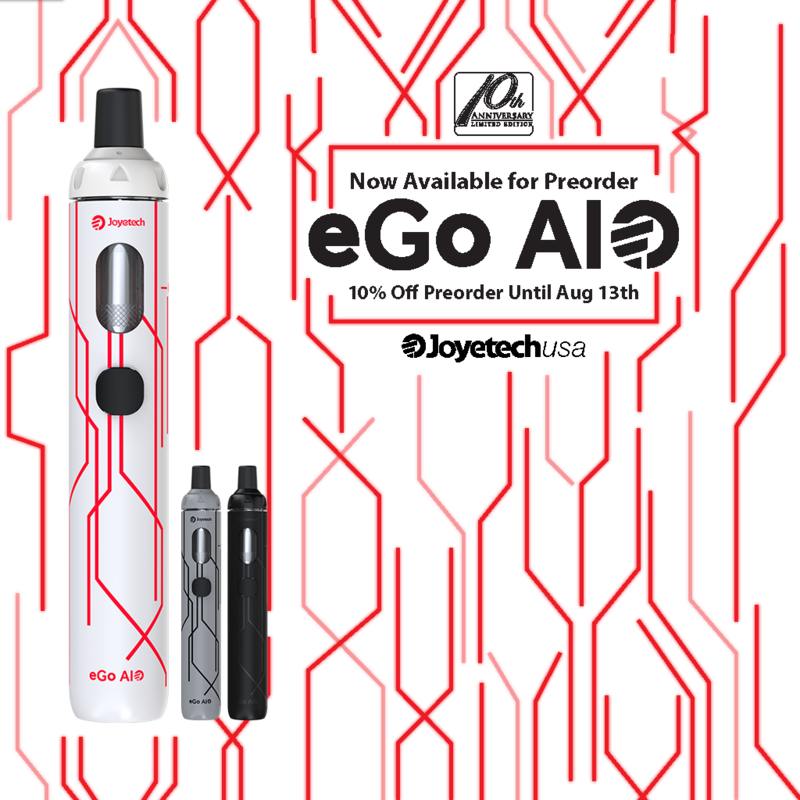 This time the Joyetech eGo AIO is back as the Joyetech eGo AIO 10th Anniversary Edition, what better way to celebrate Joyetech’s 10th anniversary but with this new eGo AIO 10th Anniversary Edition kit. The new Joyetech eGo AIO comes as great as the first version, but with some updates. The Joyetech eGo AIO 10th Anniversary Edition mod comes with vibrant LED tank lights, a 1500mAh internal battery and an anti-leaking TFTA structure. SS316-0.6ohm head, with stainless steel coil, supports mouth-to-lung inhale, creating great vaping experience of nice taste and vapor clouds. Beside the child lock design, a wealth of safety protection measures is included. The eGo AIO is simple and easy to use. Good for both starters and experienced vapers. This new eGo AIO mod also comes with a twisting cap that is specialized to be the airflow control of this device, letting you vape how you want to! Order the eGo AIO 10th Anniversary Edition now! The Joyetech Ultex T80 kit comes with the brand new Joyetech Cubis Max, what’s special about the Joyetech Cubis Max atomizer is the new Joyetech NCFilm. The NCFilm is a coil-less design that uses a slim heating device made of kanthal. The NCFilm is easy to use, just put your sheet of cotton over the heating device, saturate the cotton, and you’re ready to go! The Joyetech NCFilm also has a self-cleaning feature that’ll expand its lifespan and not give you any gross burnt taste. Along with the NCFilm system, the Joyetech CUBIS Max tank has a top fill and top airflow system to free you from any leakage. The Joyetech Ultex T80 mod uses an 18650 replaceable battery and has a max output of 80W. With the innovations of the CUBIS Max atomizer and the NCFilm, the Joyetech Ultex T80 is definitely a mod you should experience. 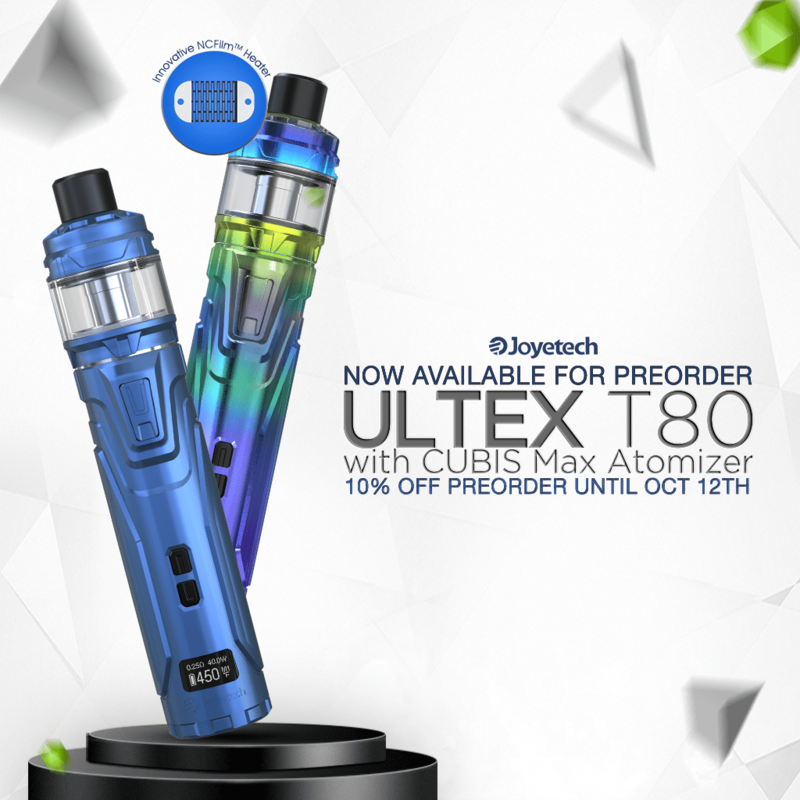 Preorder the Ultex T80 kit with the CUBIS Max tank today and get 10% off! The Wismec SINUOUS Solo is a tube mod with a 23000mAh battery, with a max output of 40W. 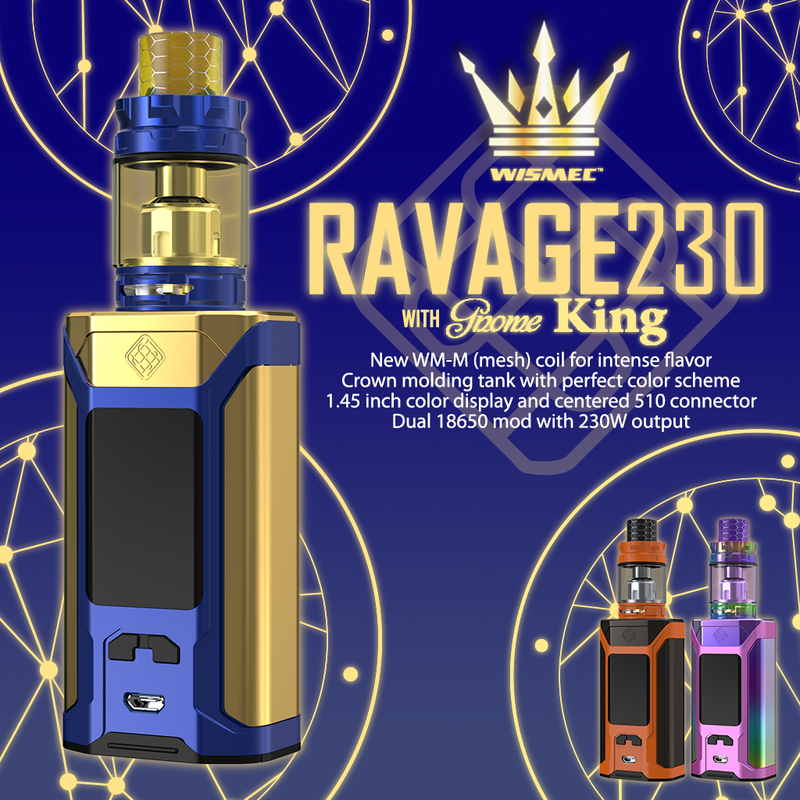 The Wismec SINUOUS Solo mod has two optional modes you can switch from; direct output and constant power output, with multiple circuit protections. The Wismec SINUOUS Solo kit comes with the Wismec Amor NS Pro atomizer. The Wismec Amor NS Pro tank utilizes the new WS-M mesh coil, which gives the most flavor and clouds. The SINUOUS Solo mod is a compact and sleek design that fits comfortably in your hand. 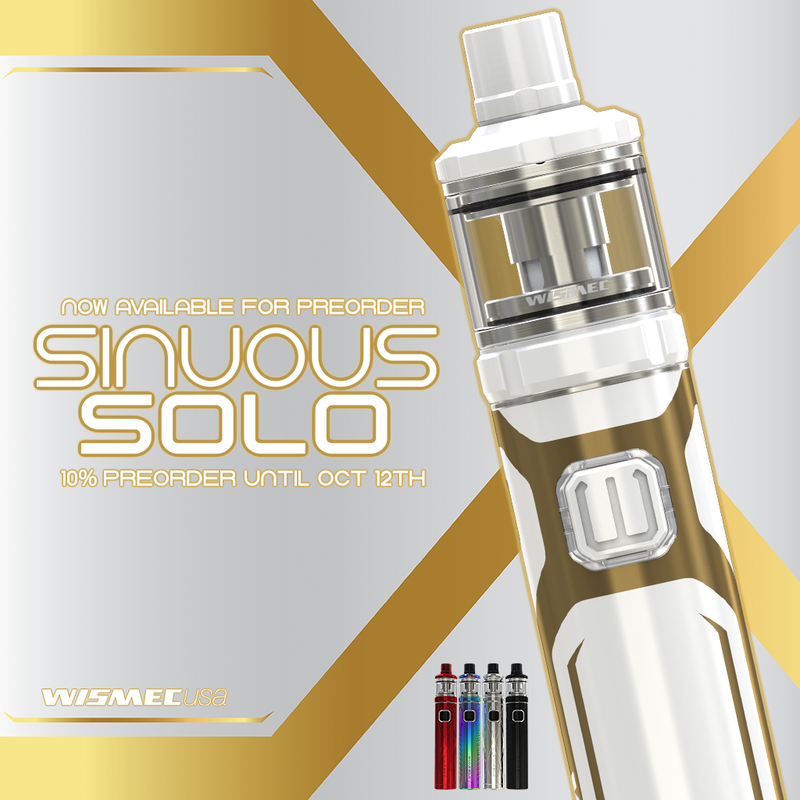 Preorder the SINUOUS Solo kit with Wismec Amor NS Pro tank and get 10% off! A new iJust has just been added to the Eleaf arsenal and it’s the Eleaf iJust ECM. The Eleaf iJust ECM mod is a 3000mAh battery with a max output of 40W. The Eleaf iJust ECM kit utilizes the new EC mesh coils; the EC-M & EC-N. The two coil heads are constructed using different style of mesh, which provides a much bigger surface area allowing for better flavor and bigger clouds. The iJust ECM is long sustainable, while its multiple circuit protections will keep you vaping safe. To fill the tank, you just need to slide the drip tip back to reveal the fill port. Efficient, simple and sustainable, it’s the Eleaf iJust ECM. 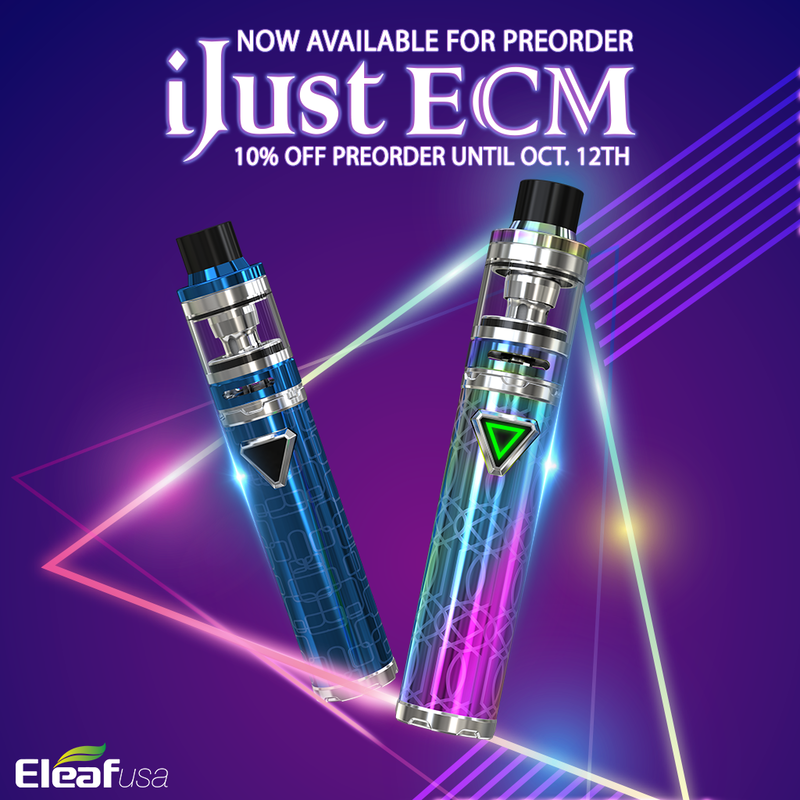 Preorder the iJust ECM today and get 10% off! The Joyetech ESPION Infinite kit is now available for preorder! This brand new Joyetech ESPION Infinite features an infinite mirror of color that this device exhibits. The Joyetech ESPION Infinite mod is a 230W two cell device that uses both 18650 and 21700 batteries. Along with featuring magnificent display of color The Joyetech ESPION Infinite also features the brand new Joyetech ProCore Conquer atomizer. The ProCore Conquer tank is uniquely designed. Having the new bulging glass tube, capacity was upgraded to 5.5ml. And we also have more spare resin and cellular tube versions available. ProC series heads are all capable: from direct lung or mouth to lung, from massive vapor production to optimal flavor. Meanwhile, its push-to-open system makes filling easily. The Joyetech ProCore Conquer utilizes the ProCD coil head that uses the new net/mesh coil system. 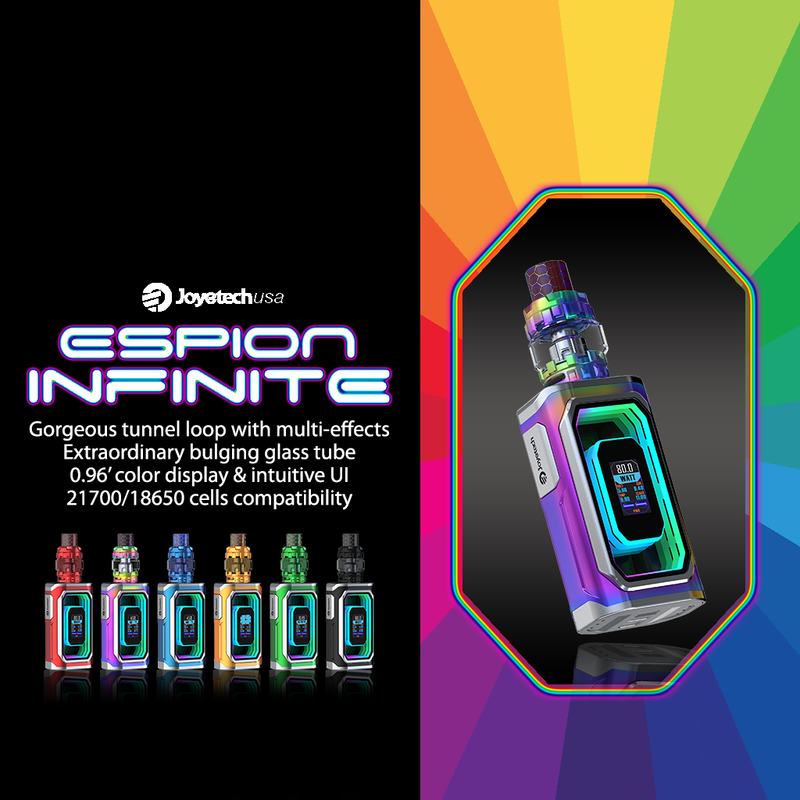 Experience a wonderful spectrum of color with the Joyetech ESPION Infinite kit. Order the Joyetech ESPION mod today! 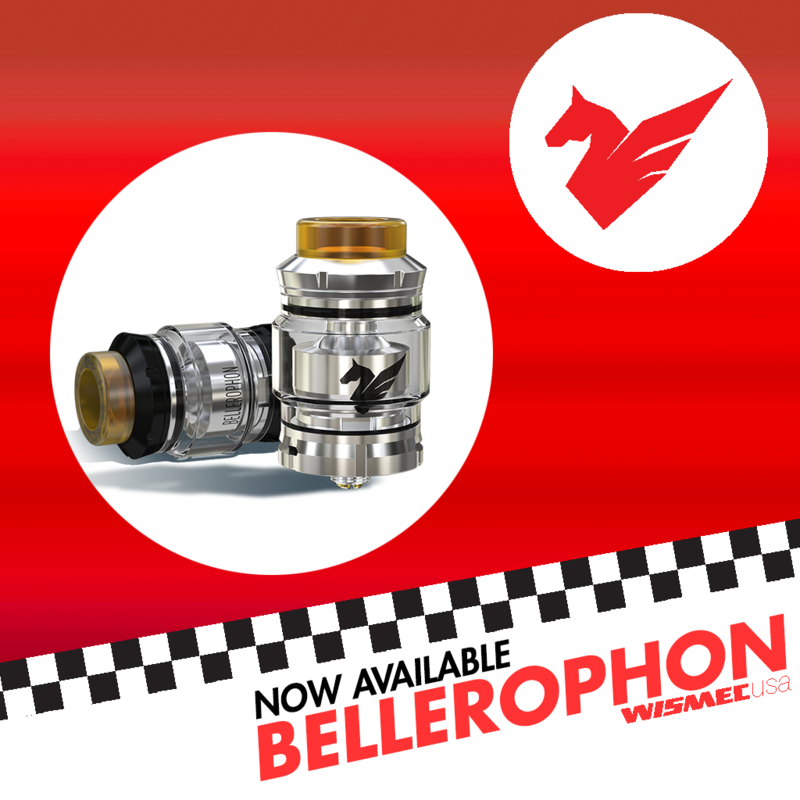 The Wismec Bellerophon is a rebuildable tank atomizer with an innovative directional airflow system. The Bellerophon’s directional airflow system can be adjusted freely with two air slots evenly spaced at the bottom, letting you adjust the airflow for your preference without losing the flavor or cloud production. The Wismec Bellerophon atomizer also introduces the Ultem 810 drip tip, which operates well in hot temperatures and can withstand hot stem, leaving you without burnt lips when you’re vaping away, all for your safety and reliability. The Bellerophon tank will be your next favorite atomizer with its innovative airflow system along with the protection Ultem 810. The Wismec Ultem 810 mouthpiece can operate well in high temperature environments and can withstand hot steam, providing a guarantee for safety and reliability. All the parts of Bellerophon RTA, airflow ring included, can be detached and reassembled, thus it is much more convenient to clean it. The innovative pattern on the Bellerophon RTA is attractive and eye-catching, another plus to the atomizer. The Eleaf Lexicon kit comes with the Eleaf ELLO Duro PMMA atomizer. The ELLO Duro PMMA is made out of Polymethyl methacrylate which is just another name for acrylic or acrylic glass. The Eleaf Lexicon’s max output is 235W, being powered by two 18650 cell batteries. The Lexicon supports a minimum of 0.05 ohm, which is capable of using with RBAs and RDAs. The Eleaf Lexicon mod bares a subtle design with a small indicator screen, but is equipped with an eye catching LED decoration on the sides and front of the device, along with a variety of different patterns and colors that you’re able to set for the Lexicon mod. The ELLO Duro PMMA tank uses HW-N (net) and HW-M (multihole) coils for the best vaping experience with flavorful cloud production. The ELLO Duro utilizes new HW-N (Net) and HW-M (Multihole) coils to give you an unprecedented vaping experience. Having a net or a multihole structure, both HW-N and HW-M coils are heated more quickly and evenly than normal coils, presenting an intense and flavorful taste. The Lexicon kit is definitely a mod to try! 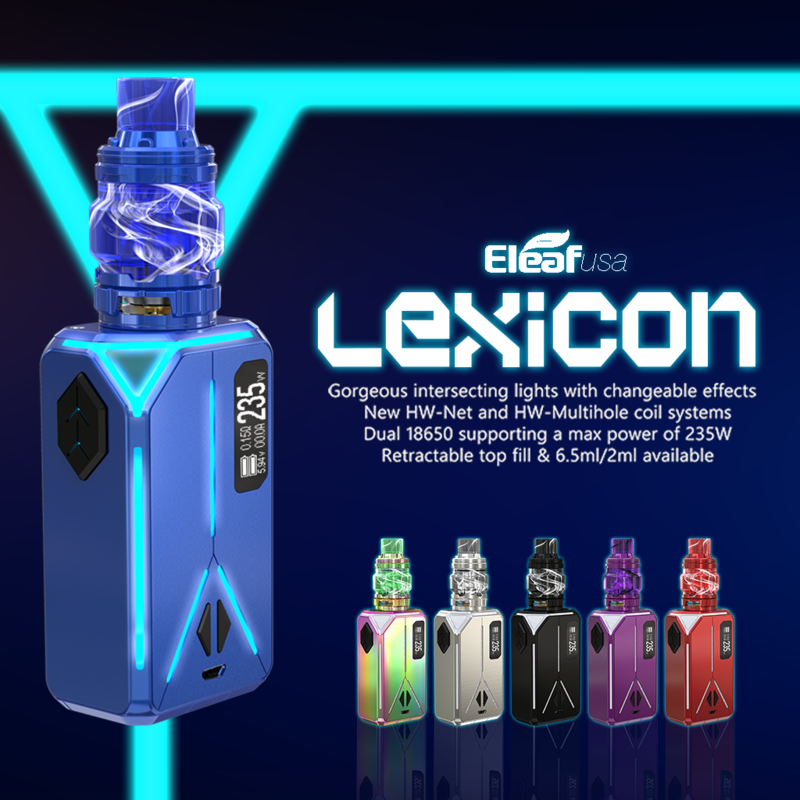 Order the Eleaf Lexicon today! 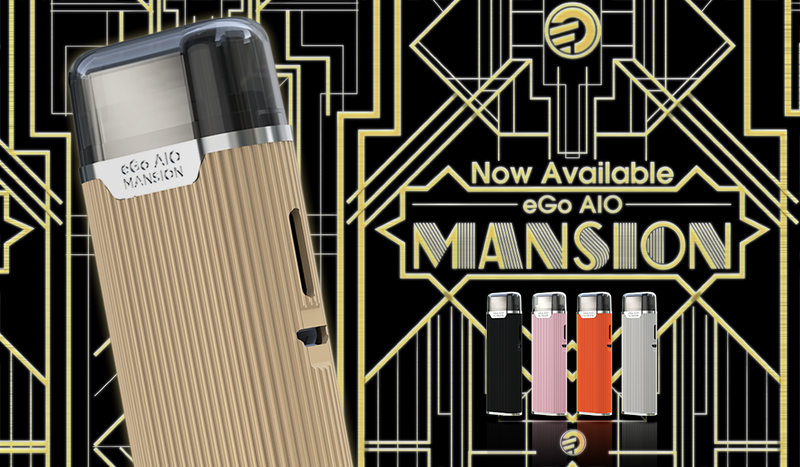 The Joyetech eGo AIO Mansion is an all in one pod system that has the aesthetic of the 1920s, but put into modern times. The Joyetech eGo AIO Mansion pod system works as a perfect compact pod vape with anti-leaking structure. The Joyetech eGo AIO Mansion mod has an adjustable airflow system that lets you adjust to your preference. The eGo AIO Mansion pod system utilizes the BF SS316 0.6ohm head to achieve flavorful clouds. The Joyetech eGo AIO Mansion comes with a top cover to protect the mouth piece from firing or any dirt getting into the device. The Joyetech eGo AIO Mansion pod system is going to be a pod system you’re going to want to experience. Having the classic all-in-one style, the eGo AIO Mansion works like a perfect and compact pod vape with the anti-leaking structure. Order the eGo AIO Mansion mod today! The Eleaf iStick Pico S is the newest iStick Pico to join the Eleaf family and probably the most unique one to date. Being powered by either an 18650 or 21700 battery, this single cell device has a bare battery tube with a corroded texture design. The Eleaf iStick Pico S kit has a maximum wattage of 100, being one of the strongest iStick Picos to date. The Eleaf iStick Pico S mod also features an LED detail that you can customize with any color. The Eleaf iStick Pico S kit comes with the Eleaf ELLO Vate which utilizes HW net and HW multihole coil heads that utilizes the mesh style coils. Order the Eleaf iStick Pico S mod today! The EXCEED series is back with the Joyetech EXCEED NC with the Joyetech NotchCore. The Joyetech EXCEED NC mod is a 2300mAh battery device that has a max output of 45W. The Joyetech EXCEED NC kit isn’t your average tube mod, the EXCEED NC mod comes with the two choices of: direct output and constant voltage output modes, for your own vaping experience. The EXCEED NC kit comes with the Joyetech NotchCore atomizer, which is mainly known for it’s for its horizontal design, along with being able to produce large clouds at a lower output, saving you some money on coils and saving your mouth from that disgusting burnt taste. The NotchCore atomizer utilizes the NotchCoil which is a re-wickable coil head with a new piece of cotton. The Joyetech NotchCore tank’s horizontal format lets the juice saturate the coil directly and is conducted through the gold plated atomizer base for faster conduction and quicker response time. With the combination of the EXCEED NC mod and the NotchCore tank, this makes out to be a perfect tube mod for any type of vaper! Order the Joyetech EXCEED NC with NotchCore atomizer today! The Joyetech ProCore Air Plus atomizer is Joyetech’s first bubble glass atomizer that utilizes the ProCA coil head. ProC series heads are all capable: from direct lung or mouth to lung, from massive vapor production to optimal flavor The Joyetech ProCore Air Plus also features a stylistic drip tip that can be switched out with the other variety of drip tips. Unique and colorful, we also have more spare resin and cellular tube versions of the ProCore Air Plus tank available. 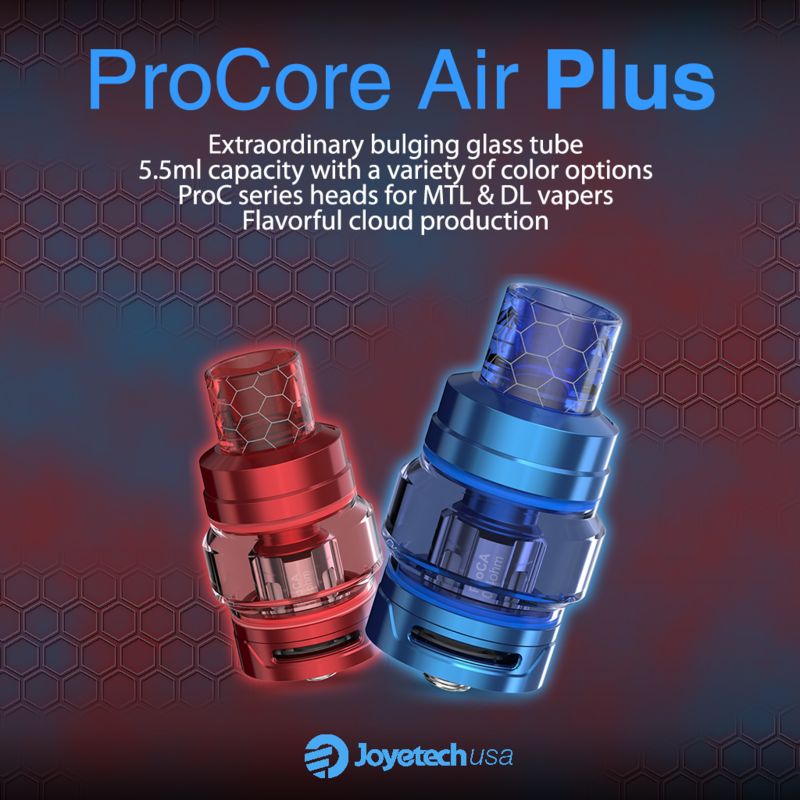 The bubble glass on the Joyetech ProCore Air Plus is also switchable as well, which also comes with different patterns and colors. Order the Joyetech ProCore Air Plus atomizer today! The Wismec LUXOTIC NC is a device that is compatible with both dual 18650/20700 batteries. The Wismec LUXOTIC NC kit is considered to be the third Noisy Cricket device with having a series or parallel mode, which allows a variable wattage mod (when in the series mod). By pushing the mechanical switch to the left or right, you can shift between parallel and series mode quickly. The Wismec LUXOTIC NC mod utilizes the Guillotine V2, which is a detachable structure that uses the Clapton 0.28ohm coil, a perfect pair for anyone that’s looking for flavorful clouds. 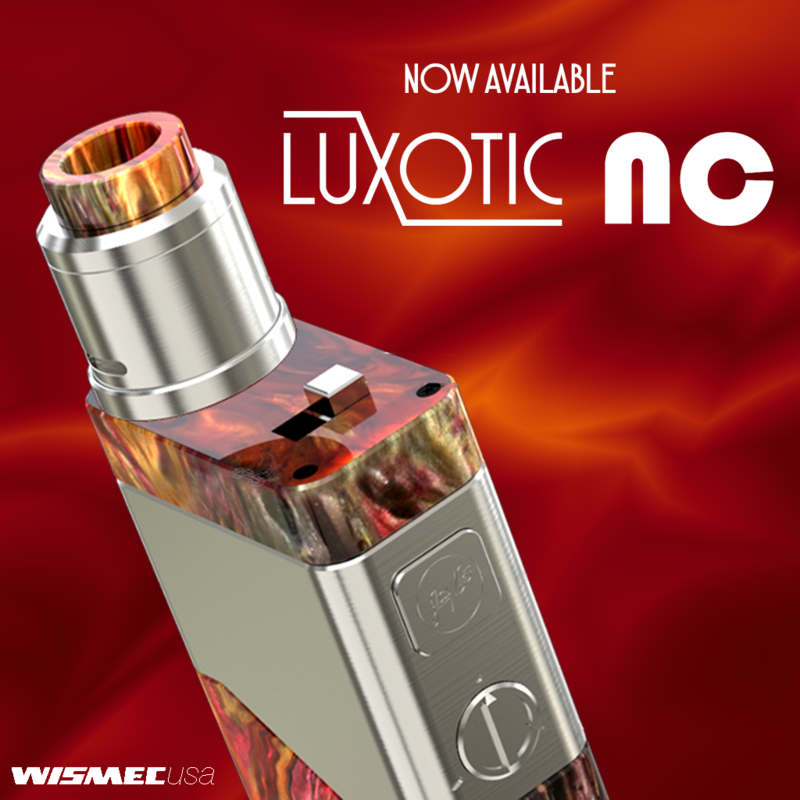 The newest device in the LUXOTIC series is definitely a device you need to try. Order the LUXTOIC NC now! 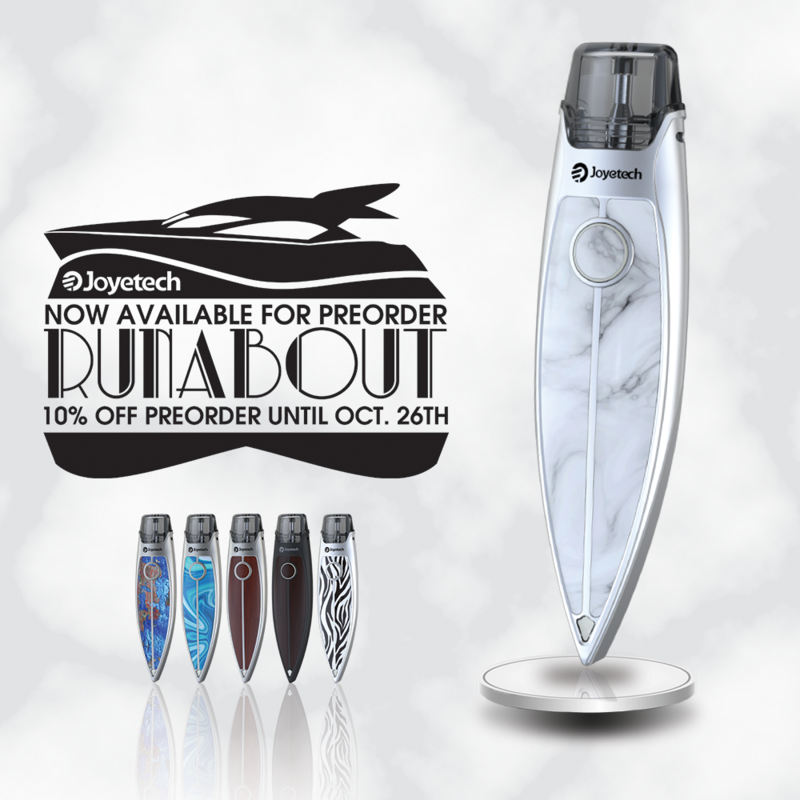 The Joyetech RunAbout is a perfection combination of form and function, with the Joyetech RunAbout pod system’s yacht like appearance, it’s a great statement of its form and with the flavorful clouds coming from a smaller device really says something about its function. The RunAbout pod system has a cartridge that can fill 2ml of e-liquid. Being a subtle device, the Joyetech RunAbout pod system has an indicator light to help you see, if it’s on and how the battery life is. Along with its beautiful design, the RunAbout has multiple protections whilst vaping. Preorder the RunAbout today and get 10% off! The newest addition to the Luxotic series, the Wismec Luxotic DF Box with Guillotine V2 tank. The Wismec Luxotic DF Box kit with Wismec Guillotine V2 atomizer features a reimagined squonk system with a bottom filling RDA and internal refillable e-liquid bottle with a max of 7ml capacity. The Wismec Guillotine V2 RDA is a bottom fed RDA. The Wismec Luxotic DF Box mod is a dual 18650 mod with a 200W max output. The Luxotic DF Box mod is reminiscent of the RX GEN3, but as a squonker. 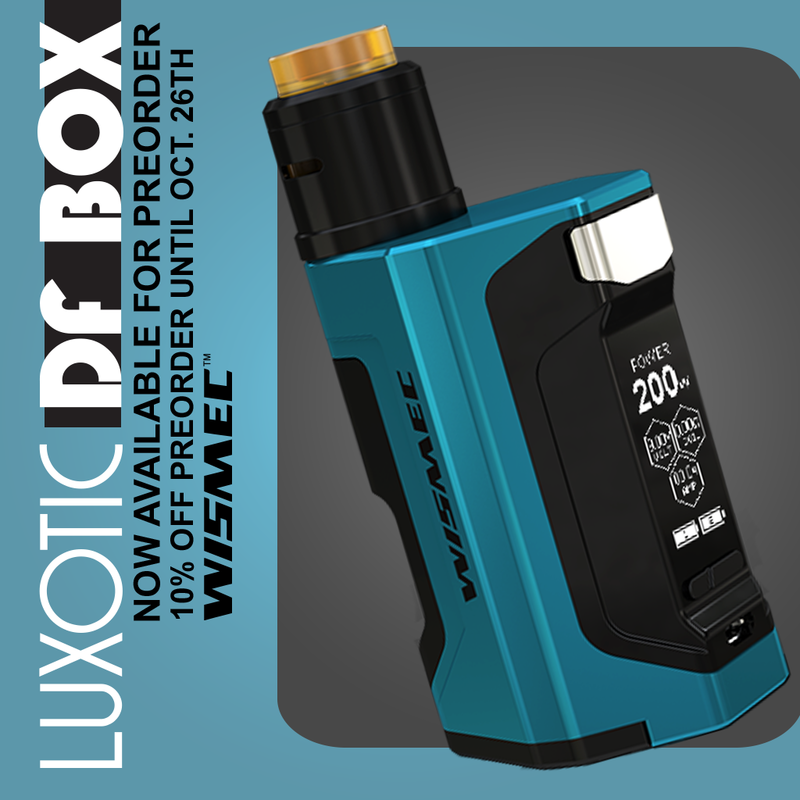 Preorder the Wismec Luxotic DF Box kit with Wismec Guillotine V2 RDA tank and get 10% off! The Eleaf iStick NOWOS is the new vape of innovations; the Eleaf iStick NOWOS mod starts off with an LED digital display and touch buttons. Along with the LED touch display the iStick NOWOS utilizes QC charging, which supports quick charging, lastly the iStick Nowos kit uses the USB Type C cord, making it easier to plug in and charge up, no guessing which side is the right side up. The Eleaf iStick NOWOS kit comes with the Eleaf ELLO Duro atomizer, which introduces two new kinds of dual mesh coil: the HW-M Dual 0.2ohm Head & the HW-N Dual 0.25 ohm coil heads. This device is the future of vaping with the amount of the future advances that the Eleaf iStick NOWOS kit is equipped with. 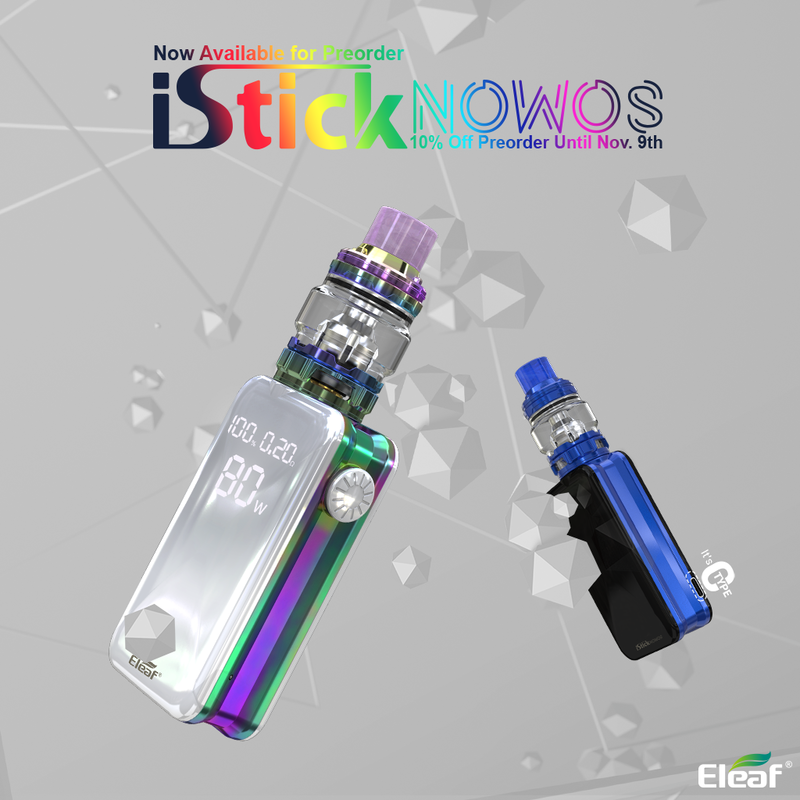 Preorder the iStick NOWOS mod and kit with or without the Eleaf ELLO Duro tank and get 10% off! The Wismec Active box has come back with some new and updated colors! The Wismec Active kit is Wismec’s first water resistant mod. Not only is the Active box water resistant, but also shockproof. The Wismec Active mod is definitely a mod to withstand nature’s obstacles. On top of the Wismec Active mod is a silicone casing and a hook to let you hook it to your belt loop or backpack, letting you transport this mod whenever and wherever you want to go. Now you’re probably thinking how can this mod get any better? Well it does! Because the Wismec Active kit is also a speaker! Yes, the Active mod is also a Bluetooth speaker that can connect to any Bluetooth device and play music! 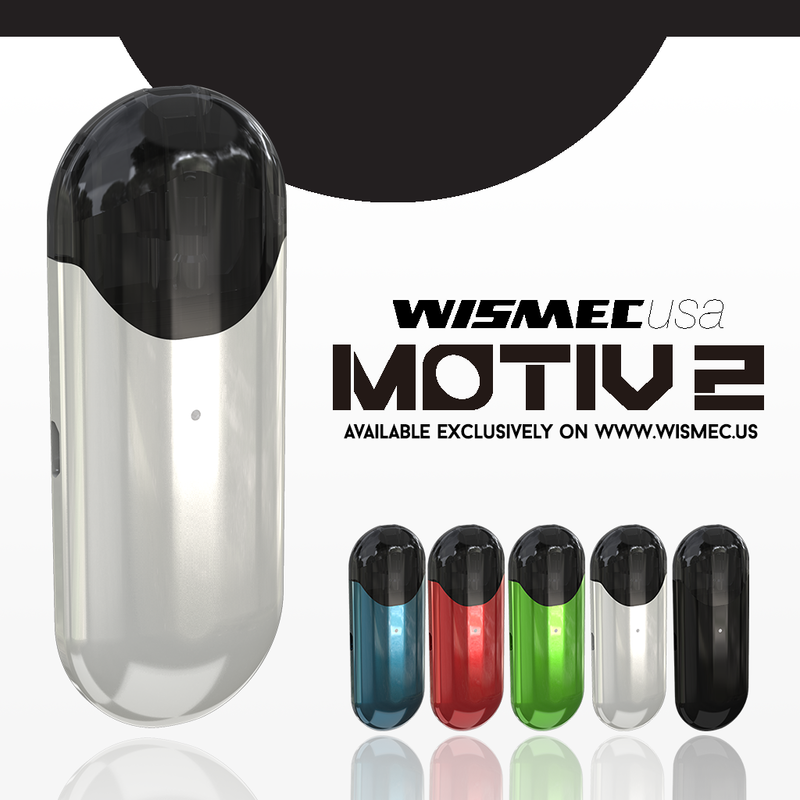 The Active kit is a 2100mAh battery that has an maximum output of 80W. The Wismec Active box comes with the Amor NSE Plus atomizer. The next level in Wismec Amor NSE series. 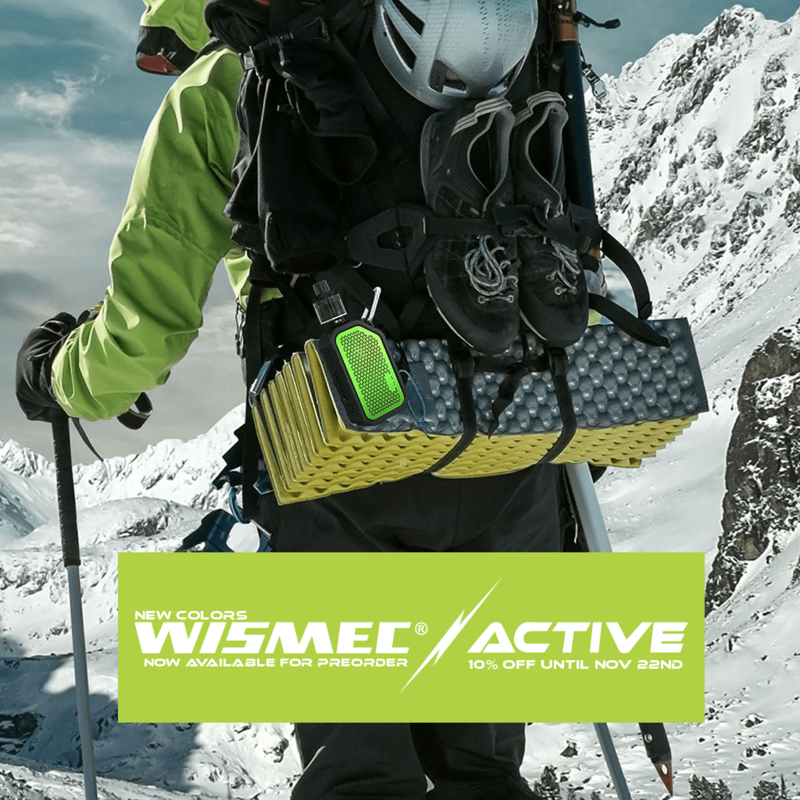 It’s time to get Active, with the Wismec Active. The new addition of the Amor NSE Plus gives this device even more DL or MTL options with giving it a stylistic flare. Preorder the Active with AMOR NSE atomizer kit today and get 10% off! The Eleaf iStick Pico X comes with the Eleaf Melo 4 atomizer, the Eleaf iStick Pico X mod still retains the iconic iStick Pico form and function, but with a an ergonomic design and grip. Like most iStick Picos, the Eleaf iStick Pico X kit utilizes one 18650 cell with a max wattage of 75W. The Eleaf Melo 4 tank uses the new ECM mesh coils. The iStick Pico X mod is also compatible with most of, if not all atomizers with a 22 diameter. The iStick Pico X kitis our first mod that has an intelligent wattage system, easily sensing the coils of the atomizer that it’s attached to. 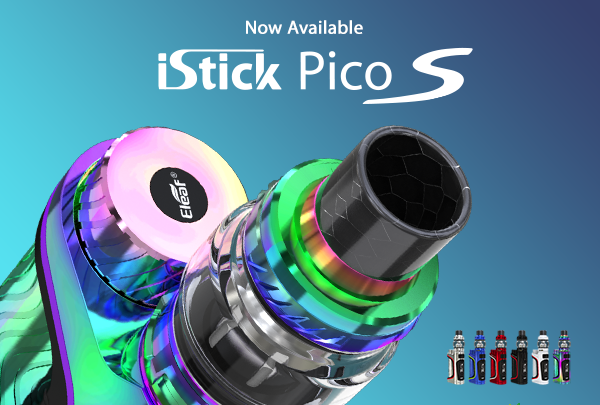 Be one of the first to try out the newest member of the iStick Pico, the iStick Pico X kit today! 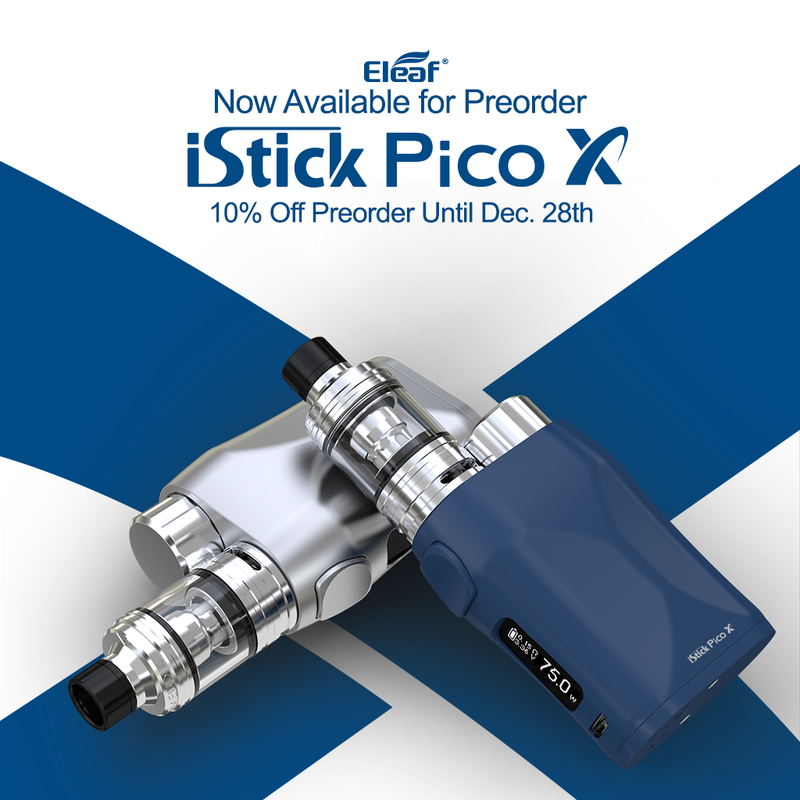 Preorder the iStick Pico X today and get 10% off! 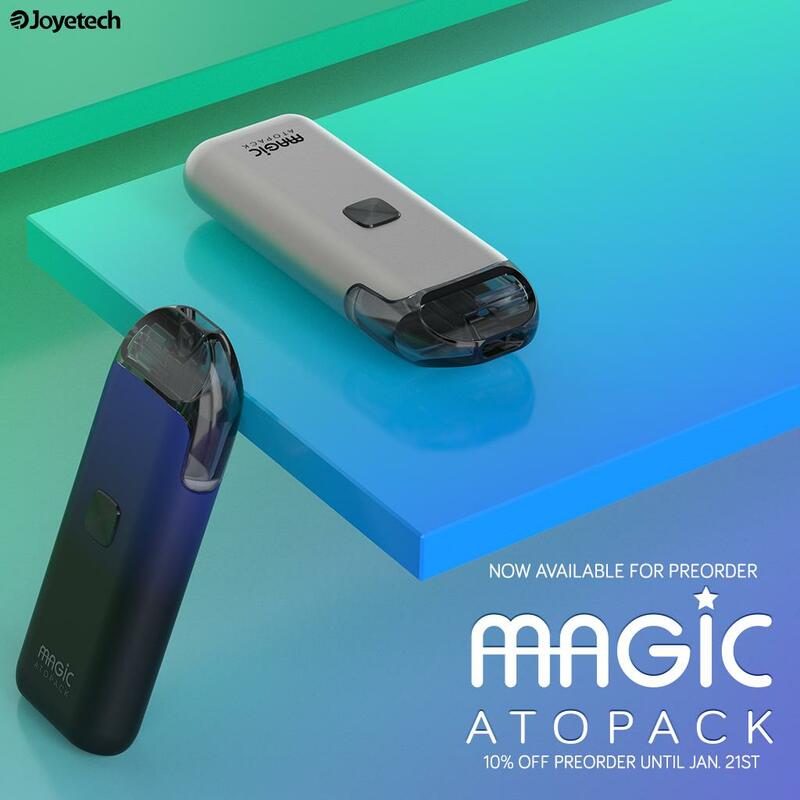 A new addition to the ATOPACK series, the Joyetech ATOPACK Magic. The Joyetech ATOPACK Magic pod system utilizes the NCFilm system, which is the first pod system to use the Joyetech NCFilm system. The NCFilm system is a coil-less system that heats up cotton in a different way. Along with the NCFilm heating system, the ATOPACK Magic pod system with the NCFilm system makes the device an ultra-efficient low voltage device. This lets the ATOPACK Magic mod’s battery last longer without taking away the cloud production or flavor! The Joyetech ATOPACK Magic mod has a quick change cotton system because of the Joyetech NCFilm heating system, just change the cotton, saturate, and you’re ready to go! The ATOPACK Magic is a brand new device on the market that definitely holds a different vaping experience at every puff! Preorder the Joyetech ATOPACK Magic mod today and get 10% off.